Dorchester’s newest restaurant, the Lower Mills Tavern, will officially open its doors next week, just in time for Dorchester Day. It’s worth the wait. The Reporter was given a chance to peek inside and sample a beer or two during a private, pre-opening event hosted by co-owner Ken Casey, the front man for the Dropkick Murphy’s, and his business partner, Brian O’Donnell, a Milton native who lives in Lower Mills and can walk to the new eatery. O’Donnell’s wife, the acclaimed interior designer Taniya Nayak, came up with the concept for the space, which sought to brighten and modernize what had become a tired-looking watering hole. The trio has succeeded in transforming the former Lower Mills Pub into a welcoming and cozy neighborhood hang-out that feels hip without a hint of pretentiousness. 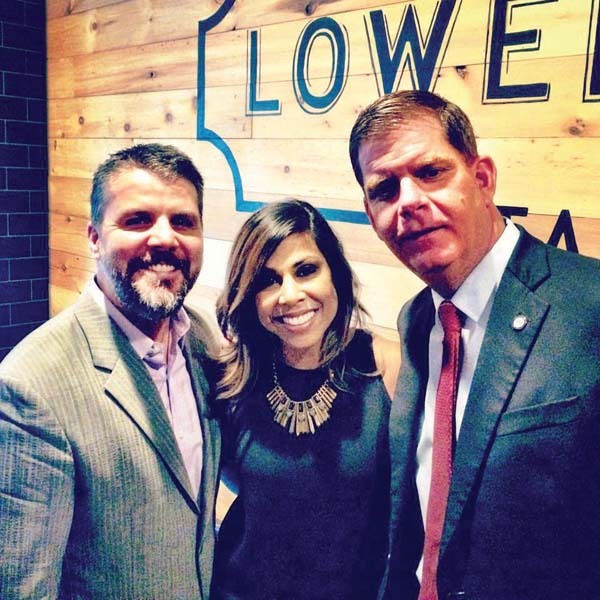 Welcome to the neighborhood: Lower Mills Tavern owner Brian O’Donnell and his wife, designer Taniya Nayak, are shown with Mayor Martin Walsh, who visited the new restaurant for a private event last week. The eatery opens to the public on May 31. Photo courtesy Lower Mills TavernThis is the third joint venture for Casey and O’Donnell, who own and operate Central Bistro and McGreevey’s, an Irish-themed sports bar on Boylston Street. They are in the process of building out another restaurant space at the Ink Block in the city’s South End. The Lower Mills project, initially slated for last fall, has enjoyed overwhelming support from the local civic association, which approved the developers’ pursuit of the pub in April 2015. But the Casey-O’Donnell team did not acquire the property until late last year, the sale having been prolonged by a licensing issue stemming from a decades-old dispute over the ownership under the previous management. In January, the new owners transferred the old pub’s liquor license to their South End project, then sought and acquired a new license for the Lower Mills space. Lower Mills Tavern exteriorRenovations went into high gear over the winter. Nayak says her husband would sometimes walk over to the space from their Milton home, pick up a jack-hammer, and pound away on the demolition work himself. In this case, Nayak and the team seized on a vintage mural that pre-dated even the old pub. The colorful oatmeal ad was painted on the side of an adjacent building and was left intact when the pub was built next to it, likely in the 1940s. Nayak added her own touches elsewhere: tufted leather booths that are favored by O’Donnell and Casey in their other pubs. Large windows that swing open in warm weather line the Dot Ave frontage and let natural light pour into what was once a darkened space, but which now has room for 91 customers. Nayak went to greath lengths to find the right vendor to install a throwback hexagon-shaped tile mosaic – with the initials LMT – that greets visitors at the entrance. Casey has been just as impressed with the menu, which is coming together under the direction of 26-year-old Colton Wood, formerly of the Ashmont Grill and Loco. 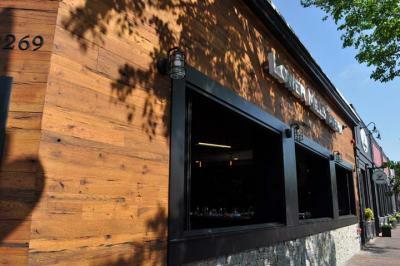 “I came in for tastings a few times and the food was way better than I expected. You know, when we started, we just planned simple pub fare in the McGreevey’s style, but this has now become a legit awesome restaurant and I think people will really like it. I definitely think in this day and age people expect more,” he said. The tavern has also turned to its neighbors down the block to help design a signature dessert: The Ice Creamsmith teamed up with Colton to create an ice cream sandwich that Casey proudly dished out to friends last Sunday. The tavern is still hiring and training staff, and the owners are careful to note that they are not open yet, despite some private events that included a visit from a prominent neighbor, Mayor Marty Walsh. O’Donnell and Nayak, who live just across the Neponset, will be regulars, too. The pub’s proximity to their home was what drew them to the project in the first place.